Lysa & Huey Ink! : Fun With Putty, I Like It! Fun With Putty, I Like It! The working time on this putty is about 3 minutes to mix and it takes about 20 minutes to set up once you have pressed your item into it. I used the Stampin' Up simply pressed clay but you can use any air dry clay like Martha Stewart or even crayola clay. 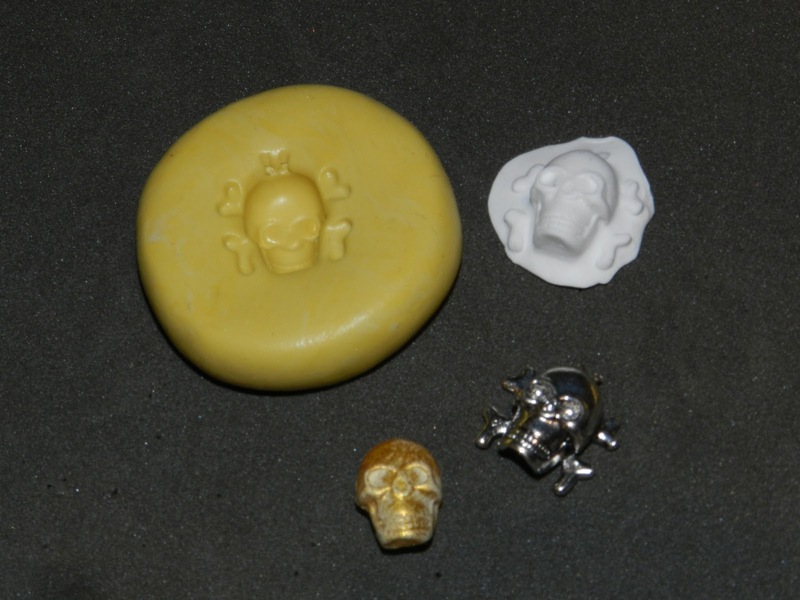 You can even fill these molds with hot things like candle wax or UTEE. I see a lot of crafters use cold cure epoxy resin to make awesome charms and buttons. Another bonus is that this product is food safe and can be used to mold things like ice, chocolate or butter. Just be sure not to use the same mold for a food product that you have already used for a craft product. I dusted my little scully with some perfect pearls and he is just to scary cute. Next time I try it I will press the metal charm in a bit deeper so that I can get a better impression of the crossbones. Also I will even off the clay so that I won't have all that extra to trim off. This is why I love to play with supplies, it all about the playtime! I found Amazing mold putty at Hobby Lobby for $19.99, with my 50% coupon it was $10 bucks well spent. I have a feeling I will be carrying a little container of this around with me. I can see me on the beach pressing seashells and such. Check out Youtube for some great videos and I am sure you will want to play with this putty too. Thanks for visiting and have a great weekend. What interesting stuff! lol I didn't realize that this putty made the mold, until I kept reading. lol Makes sense since it says "mold putty". lol Might have to check this stuff out! Thanks for the step by step look! Glad you got to play a little in your new craft room!! Welcome back crafty Lysa :) Amazing (pun intended lol) that your post is about moulding putty!! I've been watching YouTube videos and reading instructions for making doll shoe lasts. You make the mold from the doll's feet so you can fit shoes on the last as you make them. I haven't decided whether I'd manage doll shoes yet, I have a bit of a stand-off with glue!!!! We don't seem to get on very well :) I can't get the Amazing brand putty here but there's a similar product that I might try. It looks like it would be lots of fun to play with for lots of things. Did you get the email I sent last week?? Thanks for your lovely comments on the dolls. Can you shoot me an email from the "email me" tab on the blog so I can answer all your questions :) Maybe I have the wrong email addy for you? That way I can reply to your email and know it will get there!